Rock icon and KISS frontman Paul Stanley will be exhibiting his artwork and making appearances at Wentworth Gallery events in North Carolina, Maryland, and Virginia. Paul Stanley studied art at the High School of Music and Art in New York City. 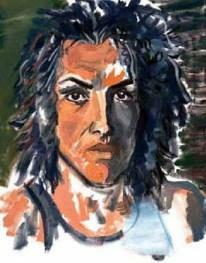 The image posted here is “Self Portrait” by Paul Stanley. Visit the Pop Life Art home page for links to artwork by Paul Stanley and other Celebrities.